Oakland, CA – The City of Oakland and the Community Police Review Agency (CRPA) have launched a new app that allows the public to file complaints against the Oakland Police Department online from any computer, tablet, or mobile device with internet access. The app is located in the complaint portal of the CPRA, https://apps.oaklandca.gov/CPR... and is a case management system that will also improve internal tracking, investigation, and data collection of complaints. The system revolutionizes the work of the CPRA and makes it easier than ever for the public to hold the officers accountable. 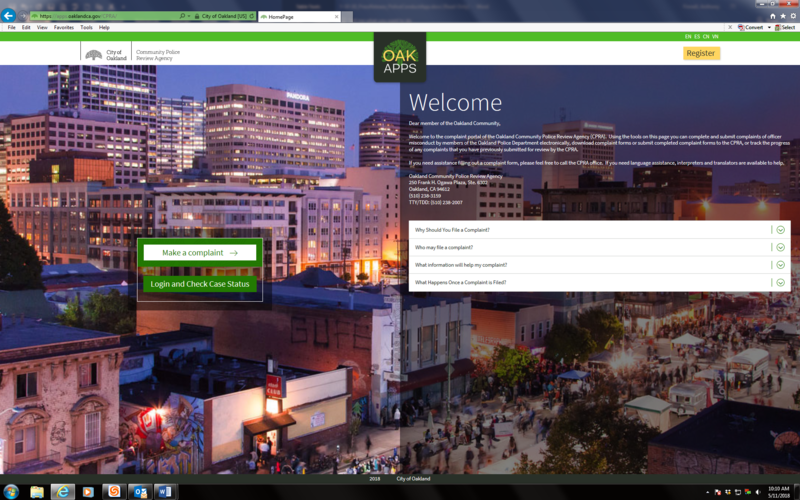 This is part of the City of Oakland’s new OAKAPPS, which offers the residents of Oakland secure and private online access to participating City programs and services. 1. Allows the public unprecedented ability to file and track complaints of police misconduct online via phone, tablet or computer. 2. Provides a case management infrastructure so intake and investigatory staff have a centralized location to build and store electronic case files, and supervisors can track the progress of investigations as well as staff workloads and workflow. 3. Provides back-office functionality to perform advanced analytics on data related to investigations, allowing CPRA staff to track patterns of complaints and investigatory details, and to create the flexibility to change the functionality of the system as the needs of the CRPA change. The public-facing portion of the new app is designed to make it easy for members of the Oakland community to file complaints of police misconduct and track the progress of investigations into those complaints. Through the “File a Complaint” function of the app, the public will be able to file complaints either under their names or anonymously, or a representative can file on behalf of an individual with a complaint who is unable to file the complaint themselves. Members of the public can attach evidence that they may have to support their complaint directly to their online complaint and this evidence will be logged directly into the CPRA case file. The single sign-on system allows registered users to file multiple complaints, track all their complaints, upload additional documents and evidence into their case file, access many documents associated with their case file, and correspond with the investigator assigned to their case through a complaint dashboard. The app helps the City of Oakland to better manage the collected data through a robust case management system. Complaints are automatically logged into the system and form the basis for electronic case files that centralize information and allow investigators and supervisors to track all aspects of CPRA investigations. The app provides back-office functionality to perform advanced analytics on data related to investigations and to track patterns of complaints and investigatory details. The internal system tracks investigations from complaint through the entirety of the CPRA investigation, including any outcomes that may occur after the CPRA investigation is complete, including disciplinary actions and policy and training recommendations. The system allows for the centralized electronic collection and storage of evidence related to specific cases including police reports, video and photographic documentation, police body-worn camera footage, witness statements, and interviews. In addition, the new system includes back-office functionality that allows supervisors to generate detailed statistical reports on all aspects of the Agency’s work, track these statistics in real time, and perform analyses of trends and patterns in complaints of officer misconduct. The back office includes numerous flexible report-generating tools based on the information stored in the database. The new public-facing app and case management system were developed over the past five months by a team of City staff from the Oakland Information Technology Department, CPRA (formerly CPRB) and outside vendor DoITLean. The project was completed on time and $100,000 under the $410,000 budget.